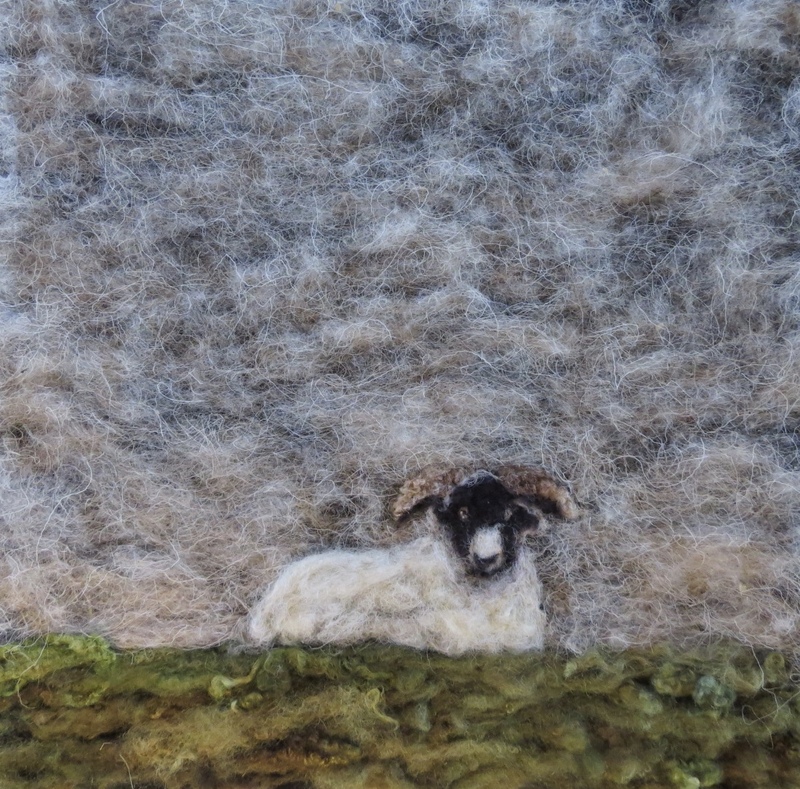 I discovered the world of needle-felting (or did it find me?!) 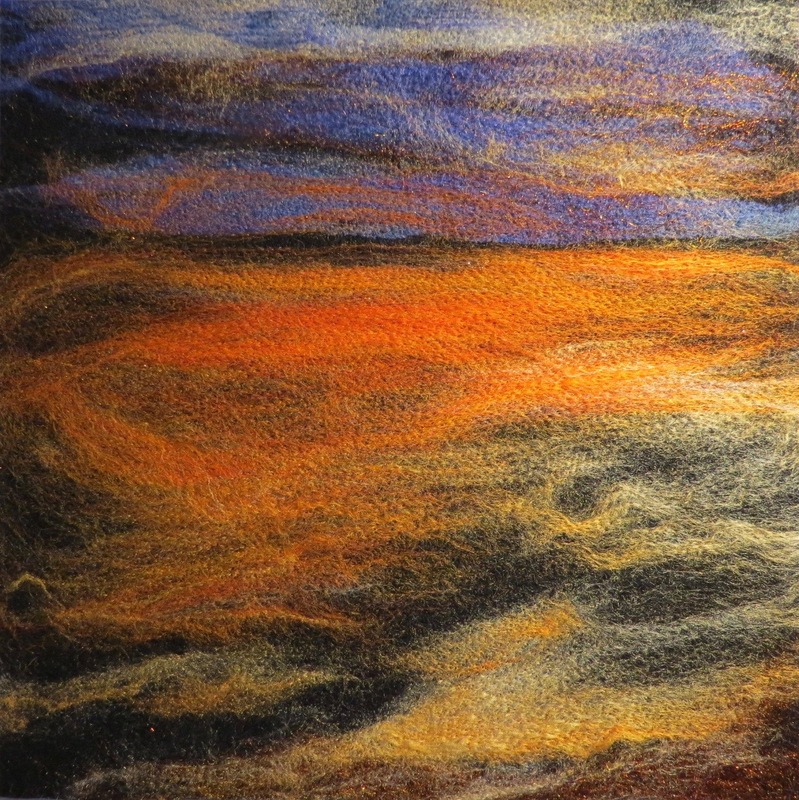 in late August 2014, admiring the 2D and 3D works on show at a gallery in Kirkcudbright. My husband persuaded me to buy a kit to have a go myself, and it all took off from there. My first picture sold in March 2015 and I have since enjoyed being part of 10 gallery exhibitions, and had work on display in a gallery on Islay. I love discovering new processes to add to my needle-felted pictures; free motion machine embroidery, appliqué, wet-felted elements, and using an embellisher machine, etc. I frame almost all of my own work and enjoy seeing the pictures develop from all the starting pieces through to being hung on a wall. I work from home which fits in well with my other hobby of photographing the wildlife that visits our garden. 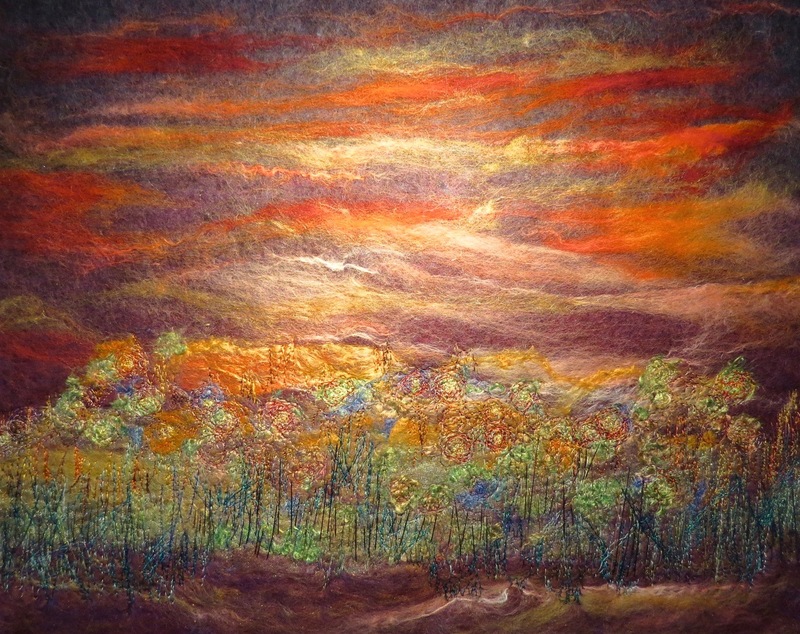 In the summer of 2016 I took on a new venture in a commission piece for a wet-felted wall-hanging landscape with sheep, using wool from their own sheep to create them; its finished size was 56″ x 28″. It never ceases to amaze me just how versatile wool can be, and how very important the domestication of sheep was in the development of human culture as a whole. I discovered the world of needle-felting (or did it find me?!) in late August 2014, admiring the 2D and 3D works on show at a gallery in Kirkcudbright. My husband persuaded me to buy a kit to have a go myself, and it all took off from there. 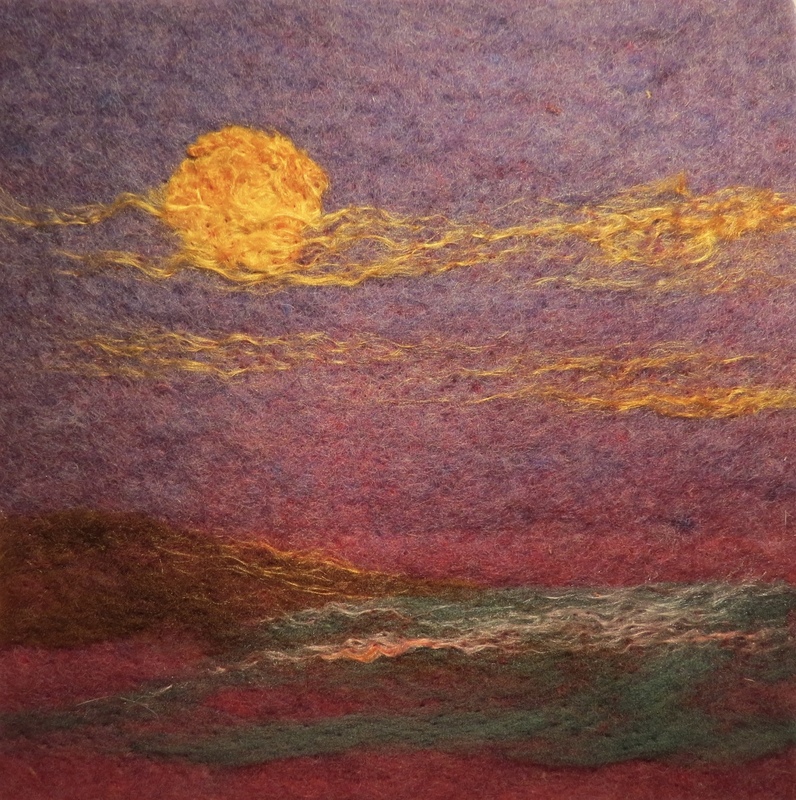 I create pictures using wool and fibres such as silk, rose, seacell, bamboo, banana, and other exotic animal fibres: camel, alpaca, angora rabbits, and yak. My first picture sold in March 2015 and I have since enjoyed being part of 8 local gallery exhibitions, and had work on display in a gallery on Islay. I love discovering new processes to add to my needle-felted pictures; free motion machine embroidery, appliqué, wet-felted elements, and using an embellisher machine, etc. I frame almost all of my own work and enjoy seeing the pictures develop from all the starting pieces through to being hung on a wall. I am based near Lockerbie, surrounded by trees and fields, near the Water of Milk. Originally, and very fittingly, the shepherd's cottage that I live in with my husband had been owned by the Castlemilk Estate, the place where Castlemilk Moorit sheep were developed around a hundred years ago. I work from home which fits in well with my other hobby of photographing the wildlife that visits our garden. 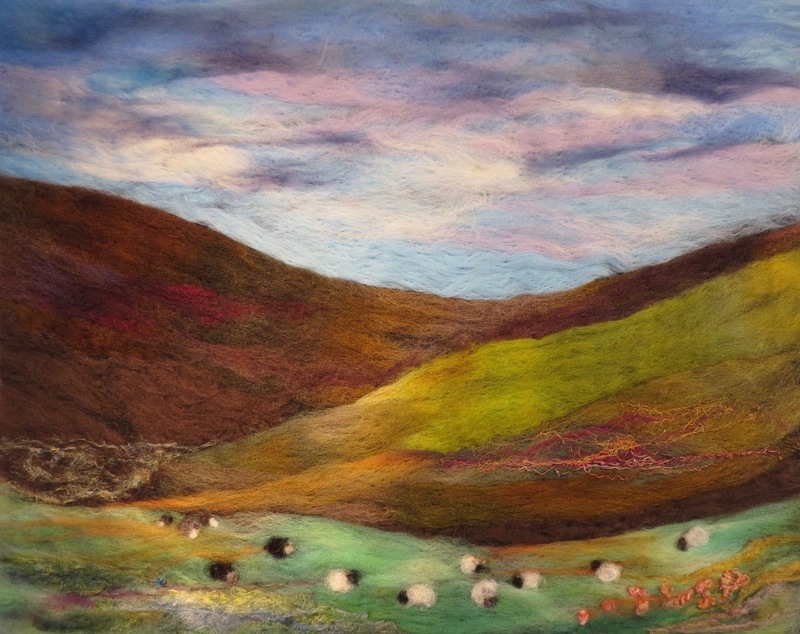 In the summer of 2016 I took on a new venture in a commission piece for a wet-felted wall-hanging landscape with sheep, using wool from their own sheep to create them; its finished size was 56" x 28". It never ceases to amaze me just how versatile wool can be, and how very important the domestication of sheep was in the development of human culture as a whole. 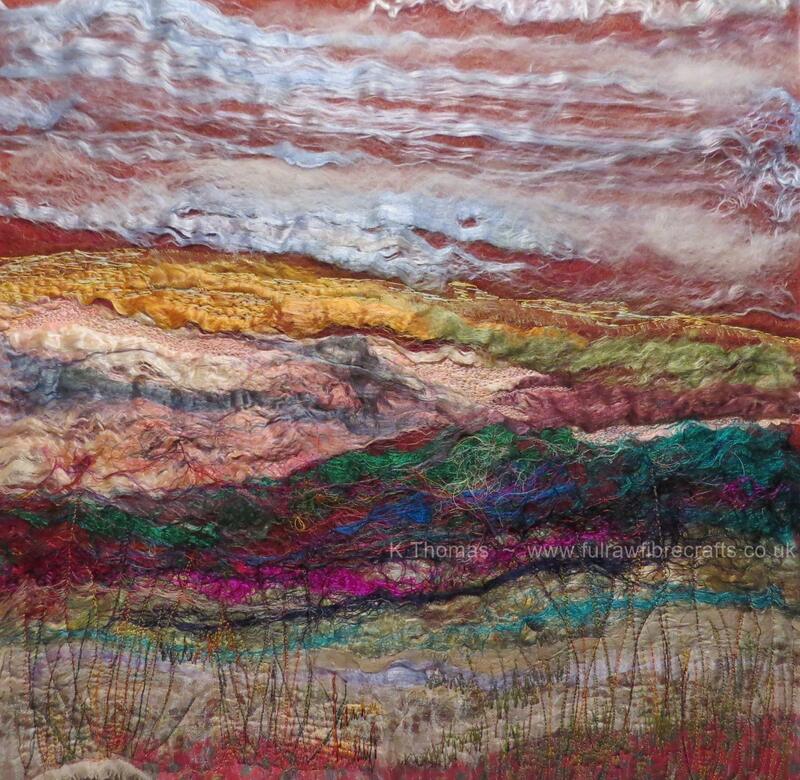 My inspiration comes from the landscapes that surround us - hills or beaches, rocks and woodlands - and the changes of colours and textures in these places through the seasons. Beautiful work. Do you have classes? Hi Toby, thank you for your query. I do hold workshops from time to time although I haven’t any organised just yet – I intend to hold the next one in October or November, though not during any school holidays. If you email me at fulraw.fibrecrafts@gmail.com I can put you on a mailing list to let you know when the next workshops are. 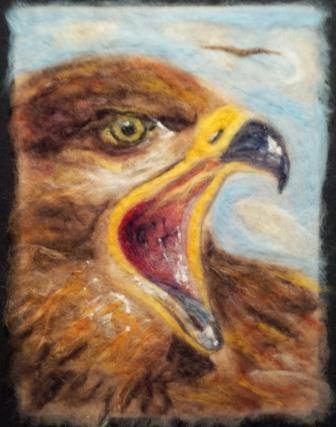 These are suitable for beginners or those who have made needle-felted pictures before, and 16 years+ and there are usually 6-10 people on the day. Feel free to ask if you want more information.